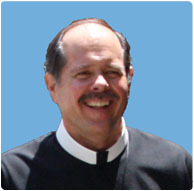 James P. McCabe, a native of Red Bank, NJ, will profess his final vows in the Congregation of the Most Holy Redeemer (the Redemptorists) July 17 in the main chapel at Stella Maris in Timonium, MD. His profession will take place during an 11 a.m. Mass that will also celebrate the jubilee anniversaries of more than 40 Redemptorist priests and brothers in the Baltimore Province. McCabe, 53, is the oldest of four children of Robert and Vivian McCabe. He earned a bachelor’s in business administration from The Citadel in 1979, and then served as an electronic warfare officer (lieutenant) aboard the USS Peleliu in Long Beach, CA, from 1979-83. He earned a master’s in business administration from Dowling College in 2005, and re-entered the Redemptorists in 2006, pursuing theology studies at Washington Theological Union in Washington, D.C. In 2009, the Redemptorists relocated their theology program to Boston College where McCabe finished his master’s in divinity in May. McCabe is scheduled to be ordained a deacon Sept. 4, 2010, at the Basilica of the National Shrine of the Immaculate Conception in Washington, D.C., and is expected to be ordained to the priesthood in May 2011. His pastoral assignment before ordination is to St. Martin of Tours Church, a Redemptorist parish in Bethpage, NY. To learn more about becoming a Redemptorist, click here.